The Great Plains Food Bank trailer sat in the parking lot of the Northern Lights Community Building in New Town, N.D., as a line quickly started to form. Volunteers helped unload the semi-trailer carrying 16,000 pounds of food as the line quickly grew to number in the hundreds. The food is part of the Great Plains Food Bank Pop-up Perishable Food Program distribution that makes stops in communities in need across North Dakota and western Minnesota. The program makes a stop in New Town around twice a year. With the nearest food pantry located 30 miles away, the incredible need quickly became clear. This April day, food would be distributed to more than 700 hungry individuals as the truck will return to the Great Plains Food Bank warehouse empty. 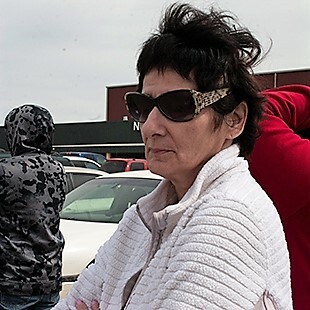 One of the patrons waiting patiently for a chance to gather food to bring to her household is Marsha Bachman. Along with bags to collect the food she receives that day, she also has a $20 bill. After the distribution, her next stop is the grocery store where that $20 will need to cover the remainder of what her household needs to survive. After the truck was unloaded, Marsha began making her way through the line to collect the items she needs. Her first time visiting the Pop-up Perishable Food Program distribution, she quickly found value in what she was able to collect. For Marsha, the food distribution helped with tough choices. She regularly finds it difficult to come up with enough money to pay for her basic needs. During the long winter months in North Dakota, finding means to pay for electric heat becomes a struggle. Her car is currently broken down and without means to get it fixed she has been relying on friends for transportation. After his first visit to the distribution, Marsha is quick to thank the donors that make the program possible and recommends to anyone needing food assistance to reach out for help.